On Thursday, Oct. 23, the setting sun across eastern parts of the USA will be red and crescent-shaped.“It’s a partial solar eclipse,” explained longtime NASA eclipse expert Fred Espenak. The new moon is going to “take a bite” out of the sun. A partial eclipse is when the moon passes in front of the sun, off-center, with a fraction of the bright disk remaining uncovered. 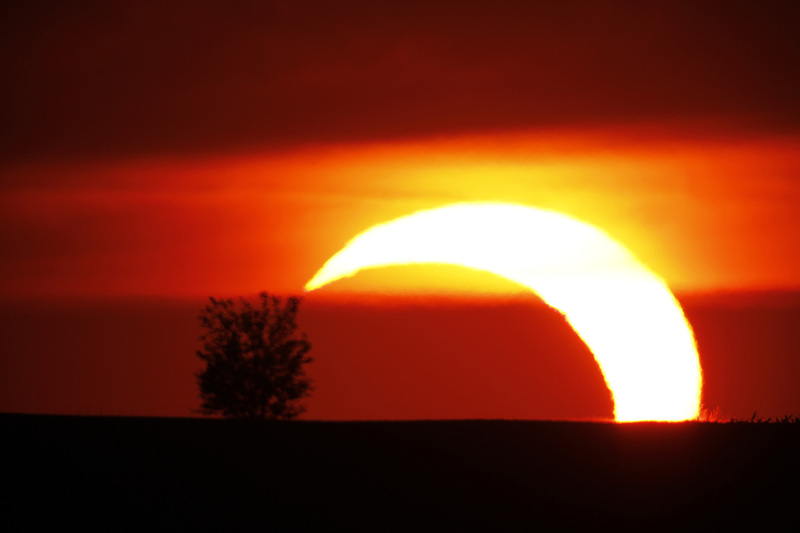 The partial eclipse of Oct. 23 will be visible from all of the United States except Hawaii and New England. Coverage ranges from 12 percent in Florida to nearly 70 percent in Alaska. Weather permitting, almost everyone in North America will be able to see the crescent. Thursday’s partial solar eclipse begins at 1:34 p.m. when the moon begins to move across the face of the sun. Maximum eclipse is at 2:59 p.m., when almost 52 percent of the sun’s face will be covered. The eclipse ends at 4:18 p.m., about two hours before the sun sets. When watching any solar eclipse, one should not observe it directly without protection. This can cause permanent eye damage or blindness. In some ways, a partial eclipse is the most dangerous to observe. It defeats normal reflex to look away from the sun. Sunglasses don’t work either. Orinoids would streaming from the south late Monday night and early Tuesday morning. There will be some Tuesday night and early Wednesday morning, too.These shooting stars are produced by dust grains left behind by Halley’s Comet. Striking Earth’s atmosphere at 148,000 mph, “meteors from the Orionids produce yellow and green colors and have been known to produce an odd fireball from time to time,” according to NASA’s website.